10 Custom Games to Use for Promotions. How to use Custom Branded Promotional Games To Drive Sales and Marketing. When it comes to promoting your business, don’t be afraid to have a little fun with your marketing. In recent years, branded custom games have attained more and more popularity as a method of capturing the attention of potential customers, allowing them to interact with you, and making them far more likely to spend money with your business. These games can act as the ultimate ice-breaker, taking customers from curious to actually engaging with your business and employees. There are a number of different custom games out there which are suitable for businesses; which one is right for you? Here, we’re profiling some of the most popular options and highlighting the advantages of each, to help you decide which one is the right fit for your business. While this might initially come across as a kid-friendly game, you’ll be surprised and delighted by how a bean toss game attracts people of all ages. Light and easy to transport, the bean toss game can be made with a full color digital imprint so it can reflect your company’s logo or imagery related to a product launch or event. The bean bags themselves can be printed with custom imagery, too; this repetition in branding helps your business stay fresh in customers’ minds. Placing a bean toss near your trade show booth, or outside of your tent at an outdoor event, is a great way to attract customer attention. Go big or go home! The giant tangle game packs a triple punch as a promotion. First, the classic game is bound to appeal nostalgically to adults, and capture the attention of children. Second, it’s a ton of fun: formatted like a classic childhood game, a spinner is used to determine where each player puts their hand or foot. Before you know it, everyone’s in a tangle, which allows customers have fun with your brand. Third, in addition to being fun, it’s a powerful promotional tool. Branding options and customization are available, making this a smart and fun way to engage and promote. It’s the perfect pick for outdoor events and festivals. Easily transform your business parking lot (or any outdoor space!) into a sales tool with an inflatable golf range. The inflatable structure itself is eye-catching, featuring a rear and backdrop which can be customized with your logo or the company imagery of your choosing. But this cool promotional tool is not just about form: it’s got a function too, acting as a safe, contained golf range which can be set up easily and quickly using a motor that sends air up into the unit. Set this inflatable up at your next trade show, outdoor event, or even in your business parking lot and bask in the attention of new customers. All you need is a basketball! This creative and space-efficient cold air inflatable free throw toss game features puffy sides with mesh netting and hoops. It can be branded with your logo for maximum impact. This is the perfect advertising tool to capture the attention of passers-by at busy events like trade shows, corporate events, or outdoor festivals. Easy to assemble using a motor that sends air up into the unit, this is an effective tool to make your business stand out from the crowd and attract customers. Looking for a bigger or more tricked-out variation on our bean toss game? Our football toss game might just be the perfect pick. It includes everything but the footballs! Your sealed inflatable football game can be designed to feature your branding and imagery so that they suit your particular needs. 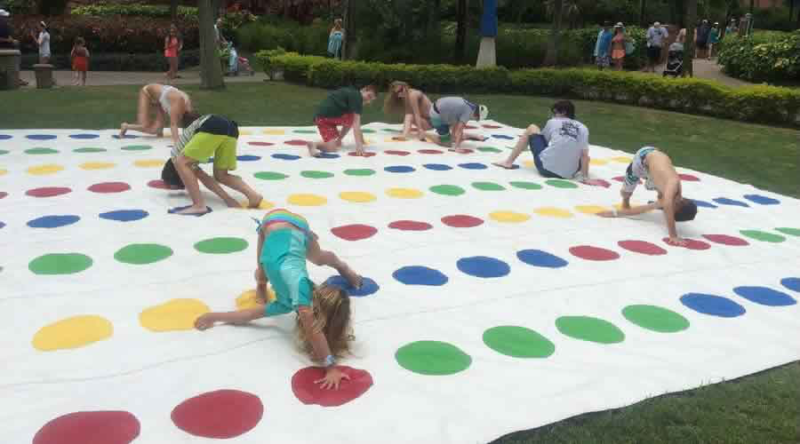 At large-scale events such as parades or outdoor festivals, these easy to install inflatables are extremely effective at getting customers to stop and check out the game. Engaging customers in this way allows you to make a good impression on them, which helps forge positive associations with your business and brand. For a game on a super scale that grabs customer attention, our basketball toss game is second to none. Everyone loves to try their hand at basketball; this nifty inflatable allows them to try it on a cartoon-like scale and have a little fun while they’re at it.In spite of its assertive size, this inflatable is easily portable and handy, making it easy to transport to outdoor events and making setup and take down a breeze. A game like this instantly delights customers and gives you common ground to talk about, allowing you to network along with a little good-spirited competition. The columns can be printed with your custom imagery, making this an extremely effective billboard for your business. Let your customers feel like they’re on a game show with this nifty prize wheel! A traditional wheel with a pointer "clicks" between 12 segments. This clever promotional item can be used on a tabletop, or modified to be a standing floor unit. Either way, you can set it up to offer services or giveaways to potential customers at trade shows, events, employment fairs...you name the event, this prize wheel can be used as a promotional tool. People love spinning the wheel, and in this case, it might just be the difference between a customer stopping to check out your business and walking on by. Golf and business are like two peas in a pod, right? Bring them together in an appealing way with our putting green game, which will bring customers right to you on trade show or event space floors, networking events, or parades.This unique modular putting green system allows the golfer to adjust the slope of the green with a push of a foot; each side has a wedge that can be raised or lowered to adjust the desired slope or pitch of the green. With this amount of available settings, this game won’t get boring even for experienced golfers! 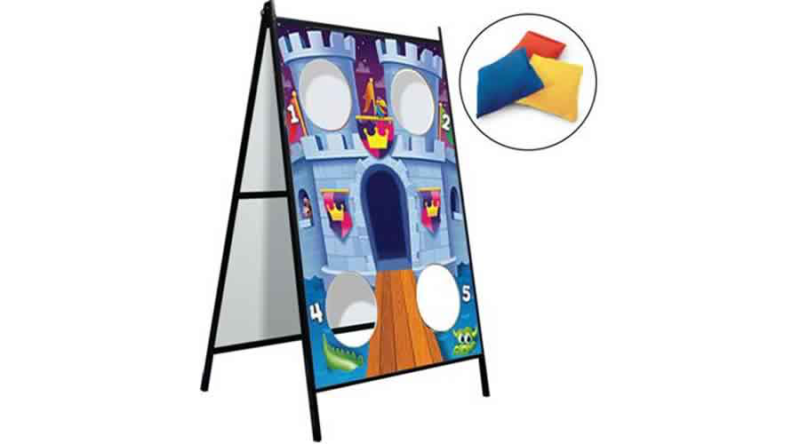 Constructed with an anodized aluminum base and high impact plastic components and a supported base, this game is built to last, and can be branded with your logo, making for an effective and engaging marketing tool. Looking for a game that’s a little different? Our hot shot game might be exactly what you’re looking for. This game offers an opportunity to make promotional giveaways more memorable and fun. Set up like a big “pong” game, a ball can be bounced along a printed flooring portion into bins featuring your logo and branding. This offers plenty of exposure to your business as customers enjoy the game. Appropriate for trade shows, sales events, and even stage shows and parades, this Hot Shot game is bound to draw a crowd and create favorable impressions. Plinko: Not all games have to be super “sporty”. Our plinko game is the perfect choice for when you have limited space (or for events where there might not be room to throw balls or bean bags!). Simply drop the puck and watch it bounce down and slide into the prize slot. You can customize your board with custom branding and prize options to make it suit your business. Not only is this game perfect if your space is limited, but since it ships completely assembled, it’s a snap to set up and transport at your next event. Conclusion: Custom games are an eye-catching and engaging way to help promote your business and establish your company as being hip, relevant, and fun-loving. By offering people the chance to engage with your brand in a playful way, you’ll forge positive associations with potential customers, and leave a lasting impression. Investing in a custom branded game is a great way to boost your business and have fun at the same time. Have you ever considered a promotional game for your business?